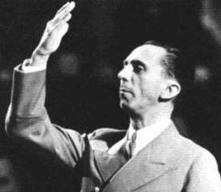 Joseph Goebbels for Vice President? Election season is in full swing, and it’s easy to tell. In their zealousness to strike back at the Republicans for having such an impressive national convention last week, two Democratic Party chairmen made remarks that after some thought, decided to regret. Massachusetts Democratic Party Chairman John Walsh was speaking at the first breakfast meeting of the state’s delegation to the Democratic National Convention, which officially begins Tuesday. Walsh was discussing the hot race for the senate seat in his state; incumbent Republican Senator Scott Brown is being challenged by the up-and-coming Democratic candidate Elizabeth Warren. Less innocuous was the comparison the chairman of the California Democratic Party made before the California delegates breakfast leading up to the DNC. Chairman John Burton was talking about Paul Ryan, referring to the alleged lies the vice presidential hopeful may have uttered during the RNC and at other times as well. Despite his early denial that there was a problem comparing a legitimate Republican candidate for vice president with the notorious Nazi propagandist of the Second World War, Burton did, sort-of, apologize. “To correct press reports of my recent comments about Republican lies, I did not call Republicans Nazis nor would I ever. In fact, I didn’t even use the word. Makes you feel all warm and fuzzy inside, doesn’t it?